We like to look after our customers at LinenMe, and we understand that sometimes the descriptions like thread count or different fabric finishes can be baffling. So here’s a simple run-down of what some of these key terms mean, and how they can help you choose just the right linen products. 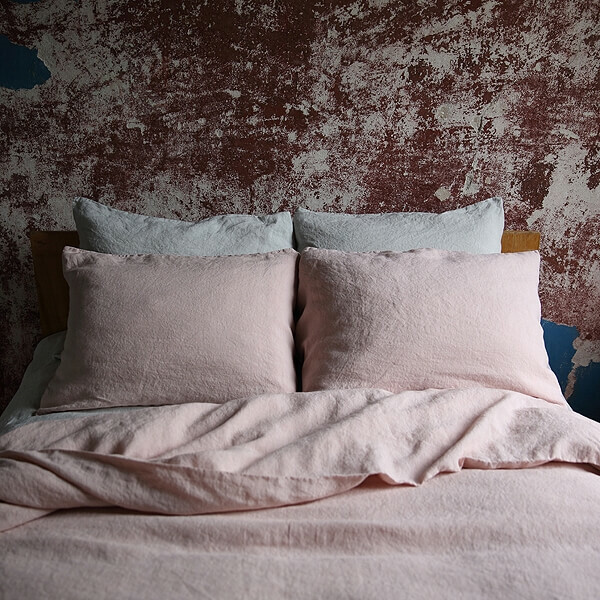 This is a huge trend right now – soft, drapey linen duvet covers or sheets in a vintage-faded colour. But how do we achieve this look? The answer is in the name. During the manufacturing process the fabric is washed in a large industrial washing machine along with stones (usually pumice as it is lightweight and abrasive). The stones pound the fibres of the fabric, loosening the weave and making them softer and more pliable. Fabrics can be stonewashed up to three times to achieve the right level of suppleness and fade. Some manufacturers are developing enzyme washes that create the same effect but without the use of stones. Due to potential damage to the fibres during stone washing it is essential to buy your linen from a reputable company to ensure the fabric has not been weakened or torn. If this name conjures up images of vagabonds and chancers, there’s good reason. 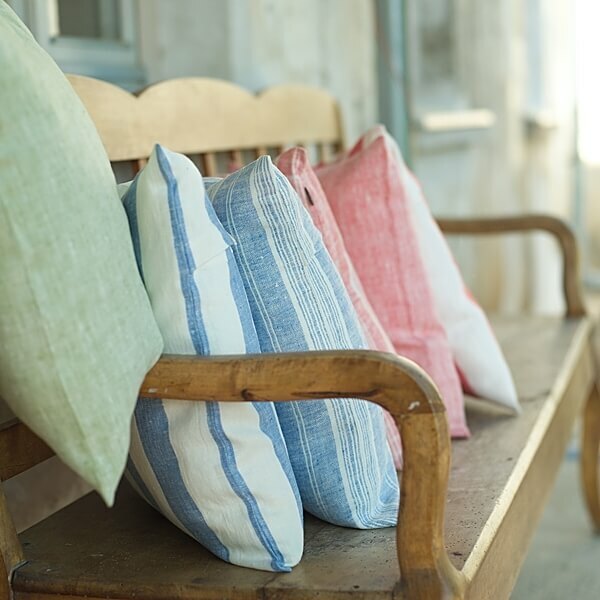 The root of the huckaback linen weave’s name lies way back in the Middle Ages, when pedlars lugged their linen wares to market on their backs. The name now applies to a specific weave, usually used in the production of bathroom towels. This traditional method of weaving the fibres creates an uneven surface and a honeycomb pattern, which makes the fabric even more absorbent by increasing its volume. 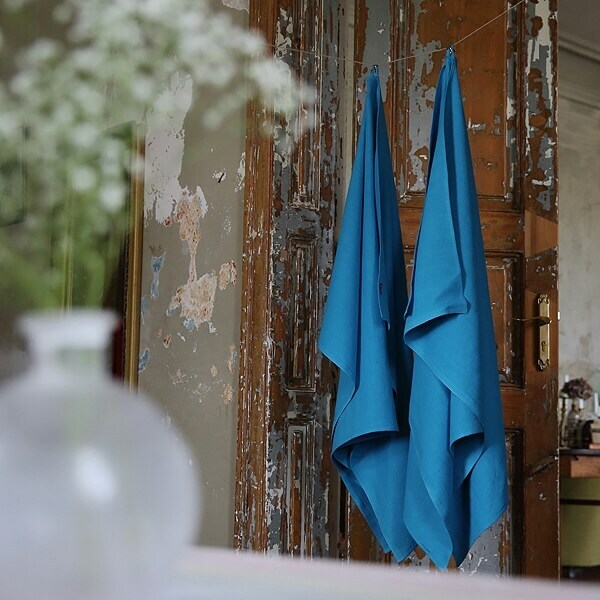 Huckaback towels are not only super-absorbent, they are quick to dry, lightweight and take up very little space, making them ideal for any bathroom as well as for travel. A gentle rub down with one of these towels will give you a great exfoliation as well as stimulating your blood supply, making you feel as great as they look. Which is why they have been a favourite for centuries. A mélange is simply a mix. In this case it refers to a mixture of dyed fibres in different colours that, when woven together, create another colour. So, a mélange of black and white fibres will create a grey colour finish, for example. When a coloured fibre is mixed with an undyed or white fibre, you get a gorgeous, subtle colour with flecks of light within the fabric. This is part of the manufacturing process in which fabric is washed to prevent shrinkage and soften the fibres. This will not produce as soft a finish as stonewashing but is a great way to prepare the fabric for use or for dyeing. Dobby fabric is produced on special looms that can create tiny geometric patterns. This can be a beautifully dainty effect, especially on lightweight linens like pyjamas and nighties. Much is made of the need for high thread count bedlinen, but in reality thread count tells you less about the quality of a fabric than you might think. In fact, it refers to the number of threads used in a specific area and relates to how a fabric feels rather than to its quality. Take linen, for example: this is a high quality fabric yet it has a low (around 50) thread count. This is simply down to the thicker fibres of the flax, and is no indication of how long it will last or of its comfort (‘coz we all know how comfy linen is, right?). Rather than focusing on thread count, try to ensure you buy from a top notch manufacturer who produces great products. Any more questions about linen lingo? Drop us a comment and we will do our best to de-bunk the jargon and help you make the perfect choice of bedlinen, towels, kitchen linen or linen clothes. For info on how to choose between different fabrics, look no further. I have bought some “softened” linen to make communion purificators. In researching whether or not I have to preshrink the material before I cut it, and how I should do this, I ran across your site. What is your opinion on this? Itwould make sense to ask your linen fabric supplier how they “softened” it. It most probably means that they already pre-washed it during softening process. If that is the fact you could cut it as most probably most of the shrinkae already happened. If it was not pre-washed during “softening” process then I suggest you wash it before you cut it.